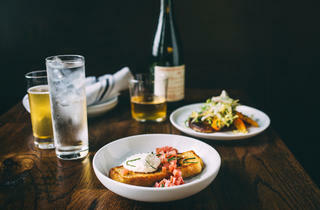 Photograph: Clayton HauckHaywood Tavern is a cozy restaurant in Humboldt Park. The comfortable Humboldt Park tavern serves well-executed food that's fancier than you'd expect, and has an affordable drink list. As soon as I sat down at a table at Haywood Tavern recently, my friend announced, “I like this place.” All she had in front of her was the Monte Carlo, a nicely balanced cocktail with rye, Benedictine and Peychaud’s and Angostura bitters, but it, plus the space, with a beautiful molded ceiling and completely relaxed ambiance, was enough to instantly like the Humboldt Park tavern. I soon echoed her feelings. Haywood Tavern, which opened in late April at the rapidly changing corner of California and Augusta, is a collaboration between chef Rodney Staton (Longman & Eagle, Bite Cafe) and Jason Balutan (California Clipper, Blind Robin), two people who know the neighborhood. And it shows—the long bar was full, mostly with people drinking, and the handful of tables were occupied by diners. While the menu would benefit from being clearly divided by dish size and is all over the place in terms of influences, it’s filled with well-executed dishes that are more ambitious than you’d expect from a tavern. There’s a burger and roast chicken, but also two-bite pintxos like piquillo peppers stuffed with deviled egg salad. Parisienne gnocchi, made with pâte à choux, had more fava beans, asparagus and mushrooms than gnocchi, so it’s a light starter. Provoleta, an Argentinean dish, is everything you want melted cheese to be, with pickled shallots and carrots to lighten it up. But it was the lone dessert, a simple but inspired griddled slice of cornmeal cake, topped with diced rhubarb, salted Chantilly cream and basil chiffonade, that made me wish every neighborhood had a place like this. Atmosphere: The space is pretty cozy, with a long bar, beautiful molded ceiling and dim lighting. It’s good for a date or a post-work drink—or as part of a neighborhood crawl. Wine bar Rootstock is located across the street, cocktail bar California Clipper is kitty-corner, and Brendan Sodikoff has another project in the works for that intersection, too. What to eat: Cornmeal cake, Parisienne gnocchi, griddled provoleta. What to drink: The beer list is excellent, and includes Moody Tongue and Half Acre beers, along with ciders and radlers. Cocktails are straightforward, but skip the ginger beer-heavy Sneeze Guard for better-balanced drinks like the Noriega, with rum, vermouth, cherry and walnut. Where to sit: There are only a handful of tables, but the front room is livelier than the back. A patio is coming soon. I love starting off a saturday with brunch at Haywood Tavern. They have absolutely stunning cocktails (I got one with infused lavender which was as delicious as it was pretty.) Their brunch menu is limited but thus far I have yet to try something I didn't love! 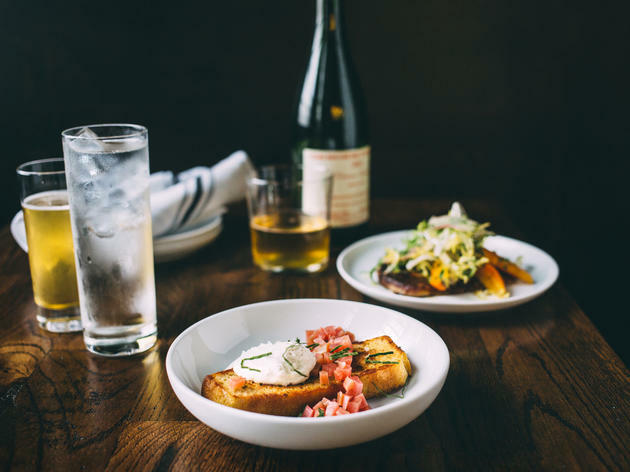 Located on the burgeoning intersection of California and Augusta, Haywood casts itself as a neighborhood tavern where you can stop in for a drink and stay for a meal. The menu includes small plates for sharing, but you'll you're better off skipping to the entrees—the burger, chicken and gnocchi are all equally delicious. Very relaxed, casual spot with delicious food and zero pretension. Well curated rotating beer list, and the best half chicken in the neighborhood. The cornmeal cake dessert is always changing and fresh, and I always find myself ordering the specials. Haywood Tavern is a great spot for food and drinks. When I went I got the double cheese burger and fries, which was really good. Also got the spicy pickled vegetables which were delicious. Love the overall vibe of the space and the service was wonderful.